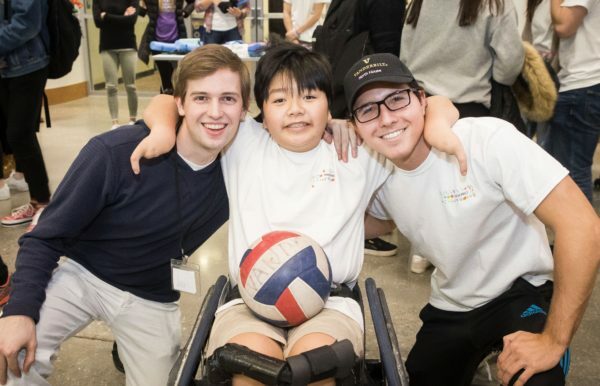 Teams of makers from Vanderbilt and beyond raced the clock to create innovative solutions to the problems facing those with special physical needs as part of Vanderbilt’s Tikkun Olam Makers (TOM) makeathon. 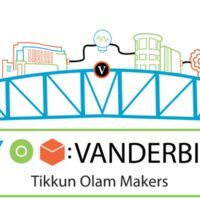 Vanderbilt’s Tikkun Olam Makers 2019 makeathon participants. Fourteen teams of students, volunteers and families worked on the prototypes. Linden strummed a guitar in the lobby of the Engineering and Science Building. The prototype of a custom guitar pick holder for his finger worked great. Zion whirled his wheelchair and kicked a round rugby ball to his TOM teammates in the ESB lobby. His chair responded to his liking. Linden and Zion, once crib mates in the same Chinese orphanage, were at Vanderbilt for a 48-hour makeathon hosted by Tikkun Olam Makers Jan. 18-20. TOM:Vanderbilt is a branch of TOM Global, a nonprofit organization based in Tel-Aviv that hosts makeathons around the world. Linden Reeder shows how his newly 3D printed guitar pic holder works. Edun Sela, CEO of TOM North America, attended the Vanderbilt event and described TOM’s mission and impact. Since its launch in 2014 in Israel, TOM has operated in 18 countries, recorded 65 maker events, and Forbes Magazine recognized it as one of 15 tech companies to watch in 2018. 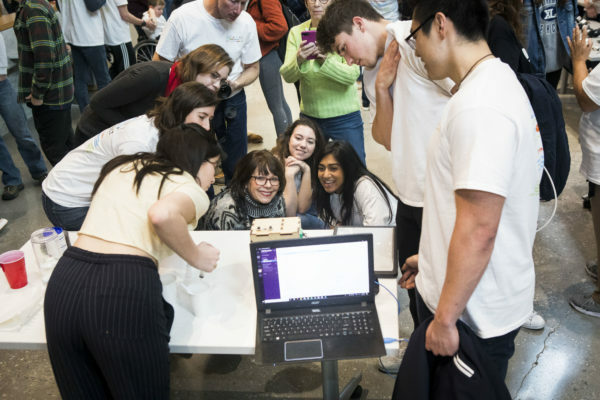 The hubbub of activity in the lobby was the finale of the 48-hour makeathon – presentations by 14 teams of final prototypes or applications. Visitors to the demonstration event pushed the crowd size to more than 150. 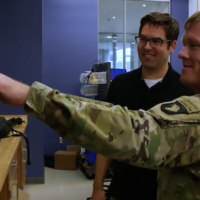 Small multidisciplinary teams of makers and a need-knower worked to create a low-cost assistive technology to help improve the quality of life of the need-knower. 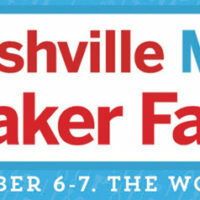 Maker teams included undergraduate and graduate engineering and non-engineering students, professional designers from the Nashville area and occupational therapists, while need-knowers are the individuals living with disabilities, caregivers or professionals in the field. Projects are submitted by application to TOM by or on behalf of the need-knowers. The assistive technologies developed at each TOM event are uploaded to an open source database available worldwide. Team Zion fulfilled Zion’s goal of making a wheelchair strong enough for him to play rugby. This was TOM:Vanderbilt’s second makeathon and Zion’s second time (Team Zion 2.0) to participate. It was Linden’s first visit to Vanderbilt and to Nashville. Linden and his mother, Lisa, traveled from Honolulu, Hawaii, for his TOM project, and both hope to return in 2020. Next year, Linden probably will be a maker instead of a need-knower. Zion and his mother, Heather, hope to return next year, too, but it will be a quick journey. Their family lives in Franklin, Tennessee. Linden’s physician in Hawaii sent X-rays and details to help the team design a custom holder. “It’s only been 48 hours and they came up with this holder that fits him rather than continually making adjustments. It’s actually made for his finger and hand,” Lisa said. 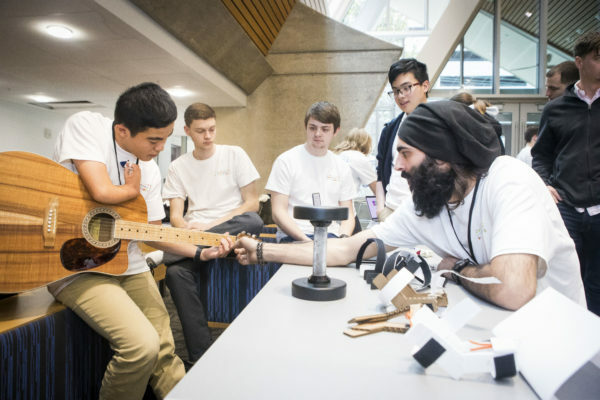 Team Linden designed and fabricated three assistive tech prototypes to provide him with more wrist stability and healthier weight distribution when he plays guitar, lifts weights and clips his nails. “Honestly, this was probably one of the coolest things I’ve done at Vanderbilt so far. 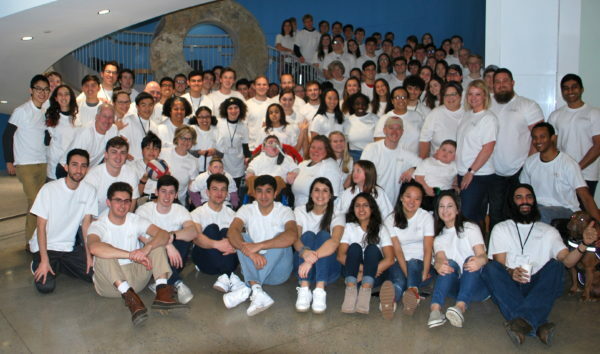 It was such a rewarding experience to work with a bunch of engineering and occupational therapists to really make a difference for someone you know. “This has helped me kind of pivot my career path,” Dumancas said. 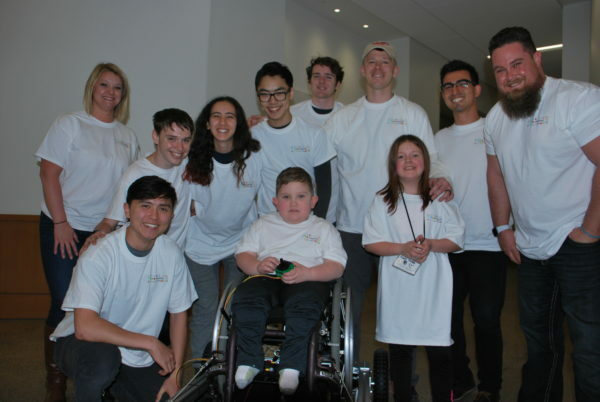 Team Brody built an all-terrain wheelchair for this active 5-year-old. Due to last year’s success, this year’s event has received a $10,000 grant from The Community Foundation of Middle Tennessee as well as additional funding from AstraZeneca and a GoFundMe account. The TOM:Vanderbilt makeathon also is a DIVE co-curricular activity, said Mechanical Engineering Research Assistant Professor Kevin C. Galloway, director of DIVE (Design as an Immersive Vanderbilt Experience), Vanderbilt’s director of making and faculty adviser to TOM:Vanderbilt. The DIVE program teaches students human-centered design thinking so they may solve complex, real-world problems, develop critical thinking skills, and work in multidisciplinary teams during an immersive, mentored project. 2019 Tikkun Olam Makers Makeathon Showcase. The goal of the event is to pair groups of engineers with people with disabilities to come up with low-cost, assistive technologies to help with the person of disability in their daily lives. Team Abigail added sensors to a walker for Abigail, who is blind, deaf and nonverbal. Team Adam created a way to attach Adam’s ventilator to his wheelchair. Team Dolphins adapted flippers and kickboards to allow people with special needs to take advantage of free swim lessons offered at seven local pools by the Nashville Dolphins organization. Team Jesse and Alex developed a customizable application to help a 9-year-old make good decisions, like choosing foods to eat. Team Kristi adapted a tray for a walker to enable the user to more easily carry things. Read more about the 2019 participants and their projects here.